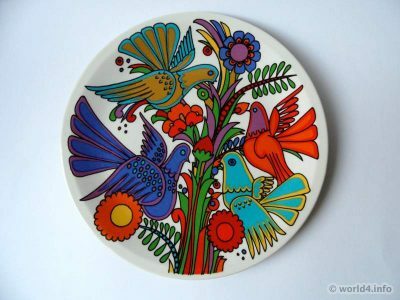 Breakfast plates with the famous Acapulco decor of Villeroy & Boch. Shown are two breakfast plates in different versions of the famous Acapulco design. Once completely filled and half decor. The design of Acapulco was inspired by Mexican Folk Art. The decor of the original series Acapulco was created and produced by 1976 to 1994. It is now available again as a new edition, entitled New Wave. Previous PostArt nouveau girl illustration, Germany 1910.